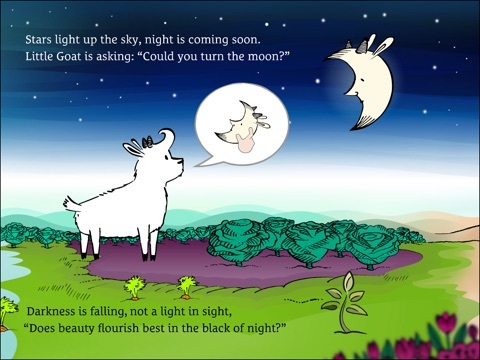 A Little Goat Builds the World is an interactive ebook designed to intrigue young children. Pages turn with a swipe of the finger, but users are in for a great surprise. This ebook turns the top halves of pages separately from the bottom halves, making a much more intricate story that will be new and different nearly every time you read it. 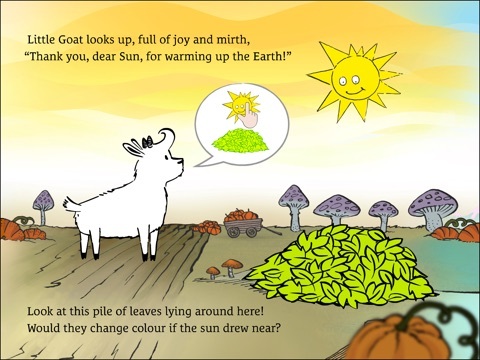 A Little Goat Builds the World is a high-quality interactive ebook designed for young children. Developers built some creative features into the design of this app, particularly the page arrangement. The top half and bottom half of the pages are controlled separately, creating dozens of possible storylines. That in itself is a marvel! In addition, the app features hidden interactions on each page and more. The two drawbacks that I noticed, however, were that there does not seem to be any sort of exit button or system, and there is not a clear set of directions so that adults can guide and assist children effectively. 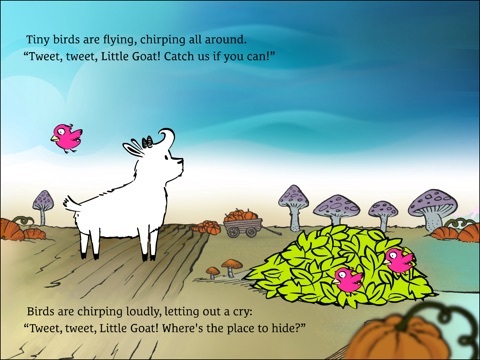 This book is so unusual that parents may need a little help in understanding how to use it effectively with their kids. 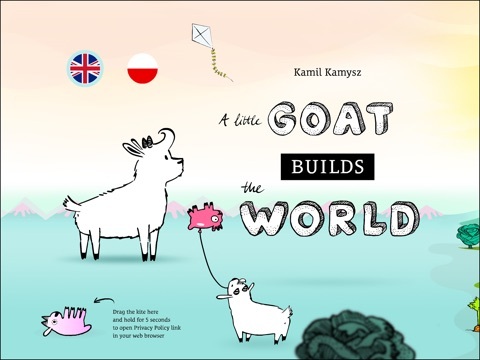 A Little Goat Builds the World is designed for young children to enjoy. The split page arrangement means that children can swipe tops and bottoms of pages in any order to create new paths through the story. As different page halves are paired together, the text changes to make the page stand together as a whole, so there are countless possibilities, and it will definitely take a while for children to uncover all of the possible pieces to the story. 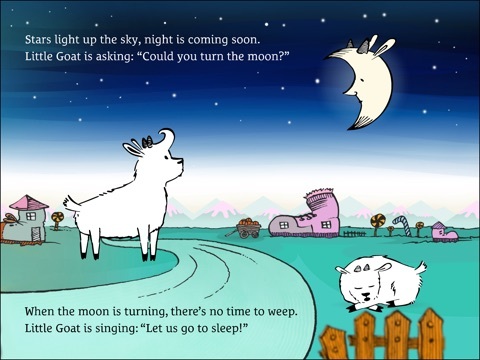 The rhyming text has a pleasant, lilting quality when read aloud, making it great to share with pre-readers. Each page of the ebook also includes hidden interactions that encourage youngsters to explore using various types of fine motor skills, including swiping, rotating, dragging, and more. One concern, however, is that some of the interactions are very difficult to find, and kids may overlook them. Developers should consider including a parents’ guide to ensure that hurried parents know how to get the most out of the app. It would also be nice if the book had an optional read-aloud system so younger kids could enjoy the story along with the interactions even if they can’t read. This unique ebook will really appeal to young users because of the unusual set up of the pages and story. It will seem like the book is different each time they read through it, which will add to the play value. The interactions are fun, as well. 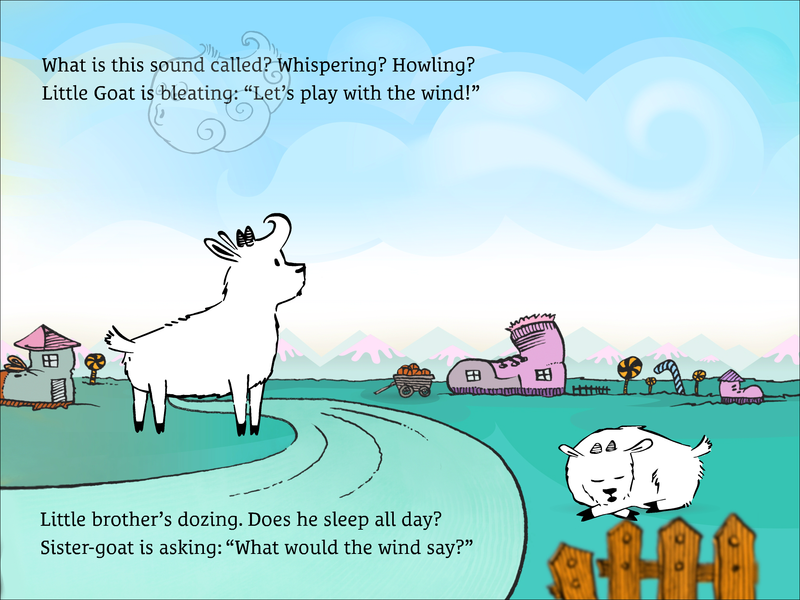 For example, there is a spot where users can drag the wind to blow on the napping goat, waking him with a tumble that little children will find irresistible. This app is priced at $1.99 in the App Store, and it’s a good value. Children are likely to return to it again and again because of the changing nature of the story. The only drawback is that some of the app’s features are challenging to find, so if a child is not a diligent explorer, they may well be overlooked, and the app relegated to the “boring” list when it should not be.